The VOLT® brass, rotatable series of LED Hardscape Lights are durable, low profile, linear fixtures designed to be easily concealed. They are simple to install and produce an evenly dispersed illumination - without the distracting hot spots seen with lesser quality linear fixtures. Typical applications include mounting under capstones; railings; outdoor kitchen counters and cabinets; benches; and eaves. The brass housing features bi-directional mounting holes so the fixture can be secured to a horizontal or vertical surface. It may also be mounted to a stainless steel mounting plate that slips under a capstone or stair tread. Their 360° rotatable design allows for maximum customization and precise aiming. The LEDs are tightly spaced and completely encapsulated in high-quality non-yellowing clear resin. These are premium quality LEDs with tight (4-step) binning for color consistency. Estimated LED life (L70) of 60,000 hrs. 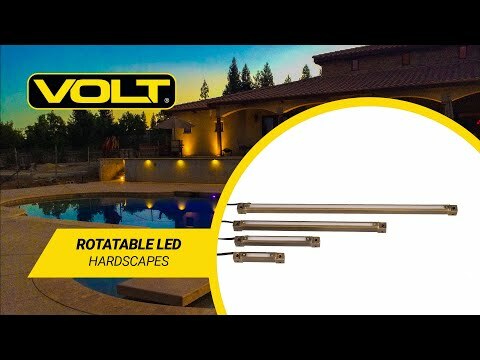 While there are many similar-looking fixtures on the market, the VOLT® Brass, Rotatable LED Hardscape Lights are the most durable and best performing anywhere. We guarantee it!